One of the major announcements at VMworld this year was VMware EVO:RAIL. VMware EVO:RAIL is a hyper-converged infrastructure appliance that combines compute, networking and storage resources. However, VMware is not entering the hardware market – they have signed up partnership with hardware vendors who build the appliance and sell it to customers. So customers still have the advantage that they can choose their preferred brand. At the time of writing Dell, EMC, Fujitsu, Inspur, net One and Supermicro have already signed up as qualified partners and during VMworld Barcelona two new partners were announced by VMware CEO Pat Gelsinger: HP and HDS. A VMware EVO:RAIL Appliance has four independent nodes. Each node has dual processors, 192 GB RAM and supports a total of up to 16 TB of SSD and HDD storage provided via VMware Virtual SAN (VSAN). The initial release allows to scale out up to four appliances (=16 nodes). At the networking side each EVO:RAIL node has two 10 GbE network ports (either SFP+ or RJ45). Each port must be connected to a 10 GbE top-of-rack switch with IPv4 and IPv6 multicast enabled. There is a Remote/lights out management available, too. EVO:RAIL supports four types of traffic: for vMotion, Management, VSAN and Virtual Machine traffic. The EVO:RAIL Software Bundle builds on proven technology. It consists of VMware vSphere 5.5 Enterprise Plus, vCenter Server, Virtual SAN, vCenter Log Insight and the EVO:RAIL rapid deployment, configuration and management engine. This new engine enables customers to configure EVO:RAIL within minutes. 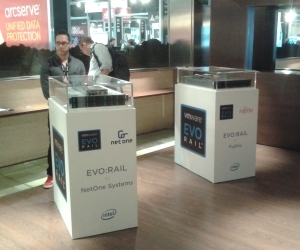 During VMworld there was an EVO:RAIL Challenge where attendees had to compete in a race against time to build an EVO:RAIL appliance. The winning time was only 15 minutes and 35 seconds! For inital configuration you only have to provide IP addresses, VLANs, hostnames and passwords. EVO:RAIL then creates the ESXi hosts, implements data services and configures the vCenter Server. As easy as configuration is scale-out. If you want to increase compute, networking and storage resources you only have to power up a new appliance. EVO:RAIL will discover the new appliance automatically and you can add it with only a few clicks.